I have used an eye cream for years now. Although I am far away from wrinkles, I think it’s good to take preventive measures. Everyone has a product that they have just never found the perfect fit for- and for me that’s an eye cream. While I used to love Benefit’s I wanted to find a more natural product free of parabens. 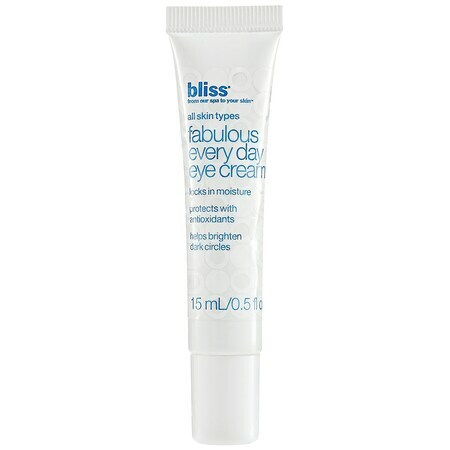 Bliss‘ eye cream does not have any parabens and is also free of other harmful ingredients. It is a true “every day” product. It is light and non-greasy on delicate eye skin and provides great moisture. For an eye cream it is on the lighter side, so if you are looking for a thicker eye cream this isn’t for you. This product does a good job at meeting most of my skin needs. It is a natural product and hydrates well without leaving a greasy residue. However, it does not do much for the dark circles under my eyes. Overall I like this product, but I’m still on the hunt for my perfect eye cream.